Info "My friends are trapped in the room back there, <player's name>! So you gotta use your vicious eye lasers and zap the weirdos that are stuck on the door. OK? OK!" Pink Eye is one of Young Cricket’s Microgames in WarioWare: Smooth Moves. 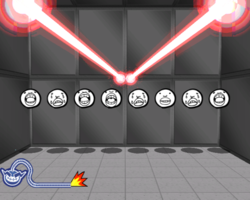 The player must zap the screaming heads with eye lasers. All it takes is contact with the lasers to wipe them out. 1st level difficulty: There is a single line of enemies. A kid is rescued. 2nd level difficulty: There are two lines. A couple kids are rescued. 3rd level difficulty: There are three lines. Several kids are rescued. This page was last edited on February 19, 2018, at 19:06.